Jamie here! I realized the other day that although I make this dish EVERY WEEK (no kidding – we just don’t tire of it) – I’ve never taken the time to give it it’s own recipe post. Maybe it just seems so simple to me that it doesn’t deserve any fuss – but it’s so vitally important to my weekly menu-plan that I finally had to write about it! 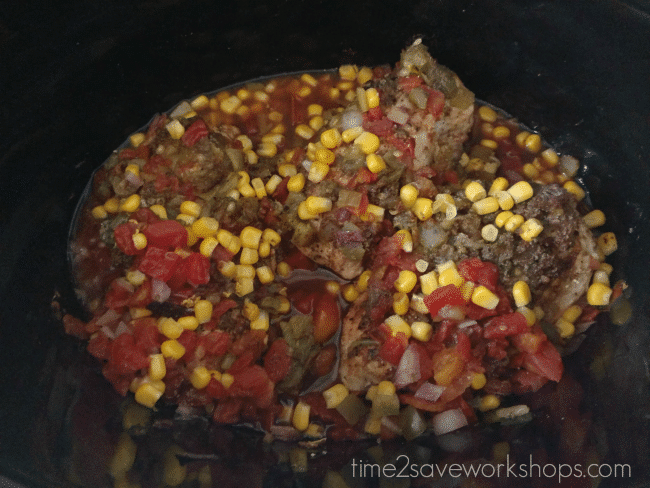 I hope you’ll like it, and after adjusting it to your taste, it becomes a handy staple to fall back on as well 🙂 Nothing like just walking over and scooping something out of your crock pot right when your whole crew starts complaining of being hungry…. 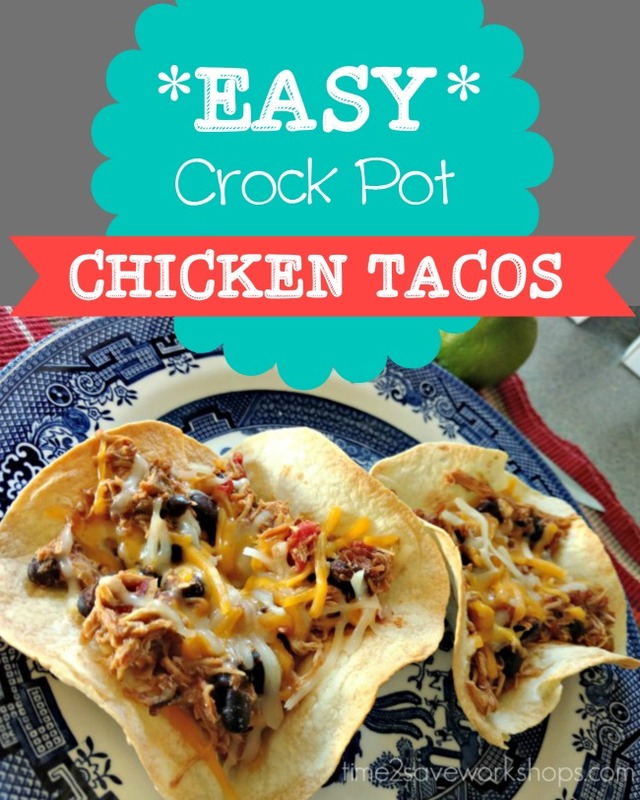 These easy crockpot chicken tacos grace our table often because they’re SUPER easy and the whole family is overjoyed every time. It’s also a super frugal meal with low-cost ingredients. Lastly, it’s infinitely versatile. I like to beef up my shredded chicken with some veggies and beans to stretch it further and make it a little more healthy – but that’s totally up to you. 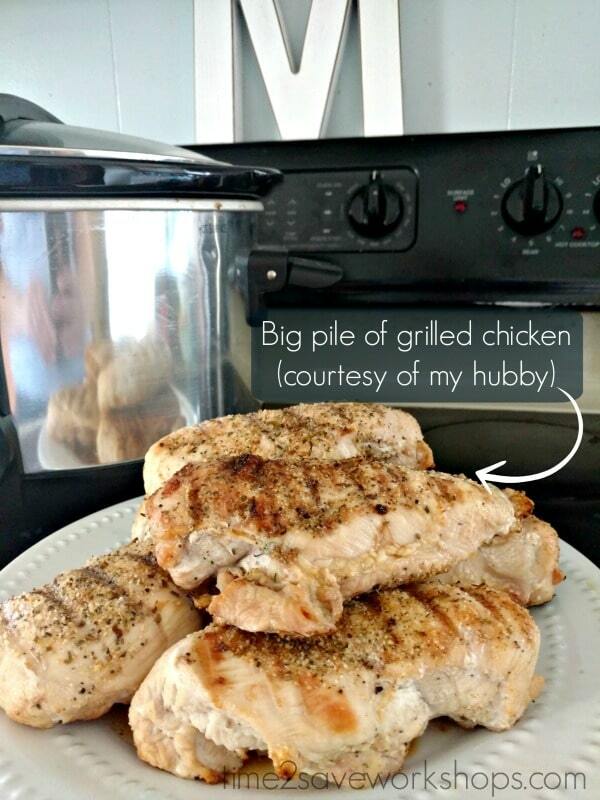 Place 3 chicken breast in the slow cooker (they can be frozen!) and cover with a can of Ro-Tel, or any another brand of petite diced tomatoes with green chiles. Add a can of drained and rinsed black beans, and then 1 cup of corn. This can be frozen corn, or canned corn, but the YUMMIEST is leftover grilled corn (just slice off the kernels from 2 ears). Cook on Low for 6 hours, or on High for 3-4 hours. About 30 minutes before the end of cooking, pull out the chicken and shred it up, then place back in the slow cooker to finish. Serve with tortillas or shells – or these super fun taco bowls. Set out toppings like lettuce, sour cream, shredded cheese and whatever else floats your boat. 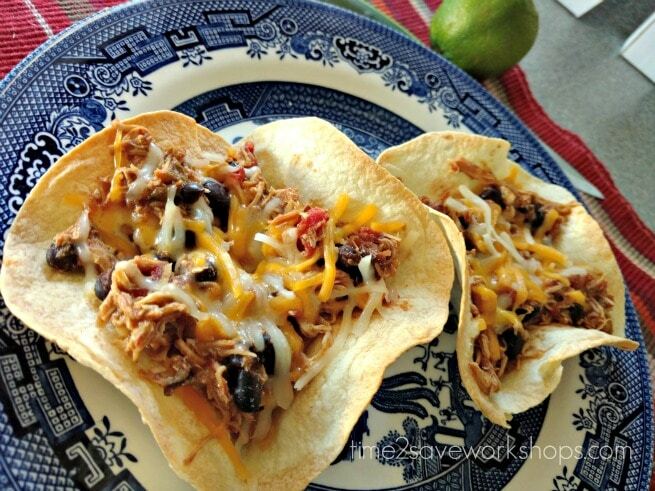 Optional: If you like a little more kick – add in a 4 oz can of diced green chiles! We love the taste of green chiles in our Mexican dishes (like these Pork Chalupas), so if I have them on hand I usually add them.